Thanks to our friend, Deborah, we have the clip of the scenes at the end of this week's episode of One Tree Hill. "Your Love Is a Song" is interspersed into it! ^Not gonna lie, awkward placement for the song, but hey! It's exposure. Also, the iTunes charts are responding. "Your Love Is a Song" has reached No. 19 on the Alternative songs chart. Here's an episode of the One Tree Hill podcast, featuring an interview with Jon Foreman. Click here to listen or download it. Also, "This Is Home" is the theme song for the ABC show "Find my Family." SWEET. Check out another set of photos from the Anaheim show. A TON of talented photographers were at that show, apparently. So good. SceneSC reviewed "Hello Hurricane" in advance of the Switchfoot shows hitting Asheville and Charlotte this week. Switchfoot returns to Asheville and Charlotte with a brand new album and DVD. 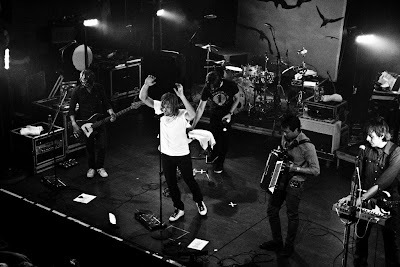 Lately at Scene SC there has been a lot of discussion about the music of the past decade, and no such discussion would be complete without Switchfoot. The band broke into the mainstream in 2003 with A Beautiful Letdown, riding hit single “Meant to Live” to double platinum status. The success of the album propelled the band to national tours and four more releases in the 2000’s, including an independently released “Best of” album. The guys recently followed up their 2006 release Oh Gravity with Hello Hurricane, and by all accounts it is another solid effort. "Mess of Me" held at No. 25, but the spins have slowed way down again, with the holidays coming up. We'll keep you updated. Keep it up guys! We're doing a great job! 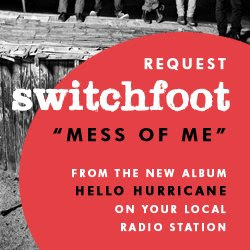 - Request "Mess of Me" on Sirius Alt Nation. We didn't make the countdown this weekend, but that's only because we started late last week. Let's do it this week!